Havat Yerushalayim, imitation of the Bak printing of 1844. Lemberg 1870. Rare book. Description of the Land of Israel, authored by Rav Haim Horwitz, moved to Israel in 1817, travelled throughout Israel and describes his ideas and knowledge as a result in this book. Originally printed in Jeruslame by Rav Yisrael Bak, and the copy here was printed in Lemberg with the additional endorsement of Rabbi Moshe Aharon of Geza Zvi and the introduction of the collector Rav Mordechai Horwitz. 63 pages (supposed to be 31). Page 60 is bound after page 62. 20cm. 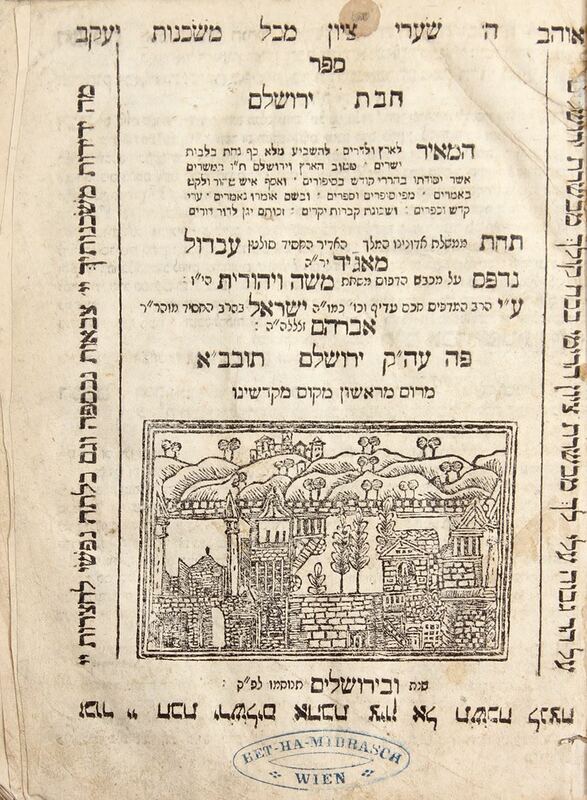 A number of imitations of this book were printed in a number of places (See S. HaLevi 23). Binding disconnected, stains, generally good condition.